Not sure if I should be writing this so soon after Endure as still buzzing due to lack of sleep and too many gels so this report may be a little too gushing. Endure must be like marmite – you are either going to love it or hate it – I loved it and thought every one of the 14 lady runners and 3 female helpers did an amazing job. The medal says ‘Life begins at the end of your comfort zone’ – if that is not your bag, then stay well away!!! My hubbie will have to have a special mention for staying up all night until it got light to get most of us ladies to the changeover point at the right time and supplying a much needed umbrella/jacket. I am not going to individually mention names as you all had your own story of the weekend and regardless of whether you did 3 laps or 8 laps everyone pushed themselves to their max. Another new lady joined us – Claire Groves, welcome to GBRC – I haven’t met you yet but I will come and say hello when I see you around. Seen your piccie but you were covered in paint at the time!! Looked fun. Congratulations to Emily on her pregnancy – very exciting news. You will be sorely missed but hoping it is only a temporary absence. You always know you will not be short of babysitters! June started off at Kirton where Sue and Marion got PBs and standards and well deserved to both of them. I am surprised that the Friday 5s have not been more supported this year as they are a lovely series. Think there is just so much choice and free park runs on a Saturday. The third round of the Essex Championships was held at Great Easton the following weekend and we scored vital points to stay second in the ladies team with 3 more races to go. Tonie was 3 seconds away from another diamond standard and took Essex bronze in her age group, with Barbara taking silver and Sue McKay taking another Essex bronze. Steph took away a PB on a very hilly course. Lara did a great race and lovely to see her running strongly and confidently again. More 5k madness at Harwich, Mickey Edwards and Parkruns – much improvement all round but special mention to Lynsey Apps who won 2 heats of the Mickey Edwards in a row and nearly made herself sick making it a third. Fiona was the most improved lady on the final Mickey Edwards taking another 19 seconds off her time, looking really strong in the photographs. Lynsey, Louise and Katie all were in for a chance of taking one of the top 3 spots in the series but Katie beat you to second spot (the men took first and third spots) so well done Katie. I know she had a pacer for 2 races but I am available next year for others unless you all speed up too much and then you are on your own. She is on her own next year!! Lynsey has been speeding up at the same time as she pedals all over Tendring training for triathlons. With Claire Reynolds and Sophie, they took part in a dry and sunny Harwich sprint triathlon – all proud of their achievements and Sophie winning her age group. As I enter reluctantly my 5th decade, been great to see the younger ladies speeding up and getting stronger. In particular, Rosie, Hien, Lynsey, Louise and Davina all have stepped up a gear. 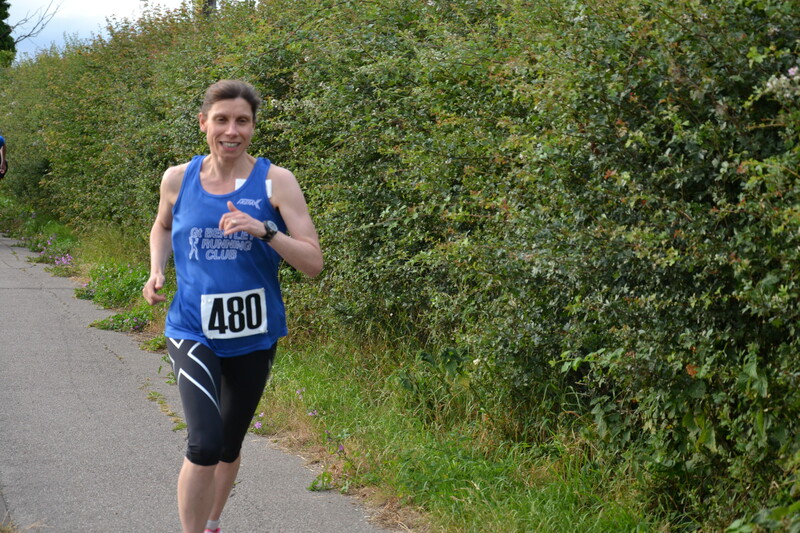 Lesley and Anna completed the Stour Valley Marathon which is an off road 27 mile course – a little bit different from your usual road marathon but photographs looked beautiful. Natalie had to pull out so hoping you are fighting fit again soon. There have been other races – Southend Half, Mersea Round the Island, Brian’s charity 5 miler in Clacton, Bury 5 miler but I am in danger of matching the length of the men’s captain’s report. All reported in Marion’s newsletter and if you are not in them, then let Marion know what you have done on facebook or by email. Before I go onto the main event of my newsletter, I do have to personally thank Sue, Anita and Marion for all their work in supporting the club this weekend. It takes an awful lot of work to organise a weekend for nearly 50 people and it is easy just to think about the work at the weekend, not how they got us there! I don’t think Sue saw her carpet for a week with all the food and equipment. So, to my runner of the month, this person joined the club in January and has gone from strength to strength. In June alone, she has new pbs at 5k, 5 mile and half marathon as well as new standards. She turned out to make sure we got team points at Great Easton and whilst I think she would have secretly liked to have been at Endure (perhaps before she heard about the rain…..), she was at the Bentley carnival directly traffic for the club. Great to have both her and her husband at the club and a well deserved Runner of the month goes to STEPH HORNER. Hopefully I have covered nearly everything for June – I stress again I do not intend to cause distress to anyone by not mentioning them and if you feel I am overlooking your achievements, TELL ME!!! A busy couple of weeks for the club so will catch up with most of you soon. Good luck to all those running at Bentley on Friday – Nicola T, Sue T, Rita, Louise and Tonie. Make the most of the home support and the flattest course around!! PPS Russ is still looking for marshalls for this Friday as we are running short in some areas. There are 140 members and only 50 people on the list so that leaves 90 people who can’t all be on holiday. If you can help, please can you email me back and I will let Russ know.